This topic contains 5 replies, has 4 voices, and was last updated by pto 5 months, 3 weeks ago. The BLM manager has discretion to close areas at Carpenter Bypass for a variety of reasons, safety being the current concern. They are attempting to manage public safety by closing trails that are in proximity to logging operations while leaving trails they deem safe to use open. If trail users ignore the closures, as some already have, DOD expects BLM to get more restrictive and it is not in our interest for them to do so. Since all of us would like to continue riding at Whypass for the next three years, even while some trails are closed, please obey signage and stay out of those areas marked closed. • Logging operations continue in Section 23 with a partial trail closure. This section should reopen soon. • Operations have begun in Section 35. This area is now closed. Signs and warning flagging have been placed at trail junctions. Check back here periodically for updated information as operations wrap up in one area and move to another. This topic was modified 9 months, 2 weeks ago by Disciples of Dirt. I was saddened to see that almost all the trails are closed as of this week. Does anyone know how long this will last or what trails are open at this point? BLM has closed all the trails in section 27 and opened the trails in sections 23 and 35. Apparently their intention is for trail users to ride the pavement from the yellow gate to alpha. 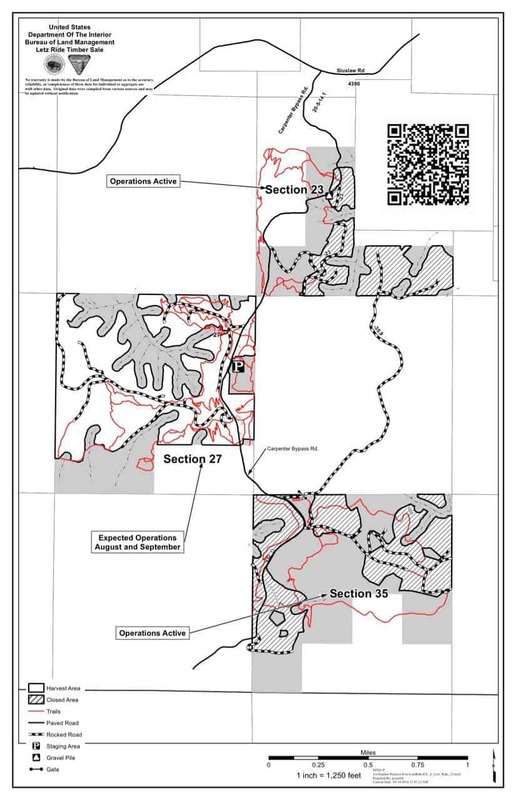 They had originally planned in section 27 to keep trails open on one side or the other of carpenter bypass road so the trail system would remain connected from north to south, but it looks like they have changed the plan. This reply was modified 7 months ago by pto. I spoke with a couple of bikers a week ago and got two sides of the story…one being the place is kinda trashed and the other saying no big deal, take your pick! Lee, Paul and I met with BLM forestry Monday nite to discuss the situation. Rock haul will continue until the end of October at which time trail closures will be posted at a finer scale, focusing on where logging is on-going or will soon commence. Trails that are currently blocked by logs or rootwads will be cleared soon. Loggers are currently working across the draw to the west of the Gift and plan to move to Salal, Burial Ground, and Letz Peek so expect closure on those trails in November. Maybe some tree falling adjacent to machine berms on Donsled as well. Stumps Don’t Win got overrun with a new road but a re-route is approved and will be authorized to build soon as BLM coordinates plans for that acreage with the loggers. Snakepath also has some road displacement, the re-route is ok’d and will be done in the near future. Moto Alley to HE is a good way to connect from yellow gate to Alpha for the next week or so. This reply was modified 5 months, 3 weeks ago by pto.